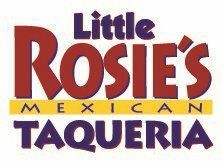 Little Rosie's Taqueria is located at the corner of Whitesburg and airport in Huntsville, Alabama. We serve tasty tex-mex cuisines including tacos, quesadillas, and delicious enchiladas. Give us a try, you won't be disappointed. All of our food is prepared from scratch daily with only fresh chicken breast and USDA select Western Beef. Rosie's chips and salsas, as well as our handmade flour & whole wheat tortillas are also made fresh all day. Try our guacamole made daily from fresh Calavo avacados or one of our margaritas made with fresh squeezed limes. Try our delicious breakfast offerings including soft breakfast tacos, melty quesadillas, and platters such as Huevos Rancheros and Austin Texas Migas.